The present publication offers to the academic readership for the first time a translation, transliteration and facsimile edition of three medieval and rare manuscripts recently traced in the Central Tibetan monastery of g.Ya’-bzang located in Yar-stod, foremost among which counts the g.Ya’bzang chos ’byung composed in 1475 A.D. Together the texts constitute a unique and compelling source for the post-dynastic history of the region of upper Yar-lung (i.e.Yar-stod) in southern Central Tibet. The sources deliver valuable information concerning the history and genealogy of the local royal house of the lHa Bug-pa-can-pa,and shed light on the formative history and rise of the religious throne of g.Ya’-bzang (est.1206), the key site of the g.Ya’-bzang bKa’-brgyud school, in particular emerging under the active patronage of this noble house. Throughout the 13th and 14th century it developed into the influental g.Ya’-bzang myriarchy (khri skor). 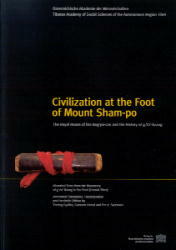 The sources include the biography of the central figure behind this powerful local entity, the charismatic g.Ya’-bzang-pa Chos kyi smon-lam (11691233 A.D.), whose monastery at the foot of the holy Sham-po Mountain turned into a powerful spiritual centre in this part of southern Tibet. A fascinating and illustrative portrait is drawn here, depicting the political and ideological mechanisms that governed the establishment of local post-dynastic rulership and its claims for legitimacy. The study,combining philology,historical research and social anthropology, may serve as a sort of case-study by investigating the background and formation of these local ruling structures with their symbiotic politico-religious relationship to the religious institutions that flourished in their domain.